Topics: Resorts & Trails, and Snow Conditions. xcski.org Cross Country Ski Areas Association : ski equipment & wax ski ..
Its 2 nameservers are ns2.trailhead.com, and ns1.trailhead.com. 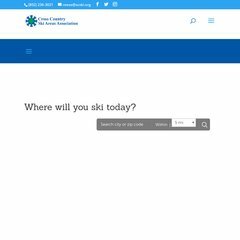 Xcski.org's IP address is 208.77.156.102. Cologlobal (Ontario, Toronto) is the location of the Apache server. PING www. (208.77.156.102) 56(84) bytes of data.